SG65BMU FIAT 500L 1.2 MULTIJET TREKKING DUALOGIC 5d AUTO 85 BHP - 31k miles- Full Fiat Service History ! The larger 500L boasts a spec of 17" alloy wheels, radio/cd/aux/usb, bluetooth, multi functioning steering wheel,rear park sensors,Cruise control, city steer, trip computer, electric windows and remote central locking. The 1.2 diesel is £20 to tax due to its extremely low emissions meaning it is incredibly economical with Fiat fuel consumption figures showing 76.3mpg extra urban and 70.9mpg combined.The 500L Looks lovely in Yellow and has so much room inside! The 500L also has great visibility also with very few blind spots aiding with parking and all round safety ! superb value for money at this price! Established in the Italian city of Turin back in 1899, Fiat is one of the world's leading automotive manufacturers. 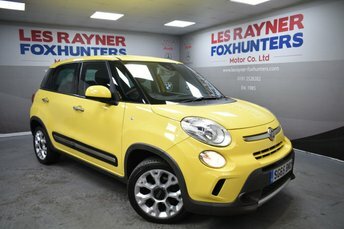 Here at Les Rayner Foxhunters Motor Company Ltd we stock a varied selection of used Fiat cars, from compact city runabouts like the stylish Fiat 500 through to the agile and sporty Fiat 124 Spider convertible. Whether you're in the market for a soft-top or a family hatchback, our team will be able to help. We're the leading supplier of used Fiat cars in Whitley Bay so be sure to start the search for your next vehicle right here. Why not contact a member of the showroom team to discuss your requirements in more detail and to arrange a test drive.